Ever since I read Stephen King’s On Writing twelve years ago, I’ve been acutely aware of my biggest fault as a writer: my inability to achieve distance from my own writing. King talks about finishing a manuscript and then putting it away for a few weeks, letting it mellow a bit, in order to return to it with fresh eyes. But fresh eyes, man. That’s the rub right there. I have written many novels. And I have edited them, too. But when it comes to actually being able to see beyond my work in progress, to be able to step away far enough that it no longer feels familiar… that’s been a big challenge for me. I’ve written about my struggles with rejection before. And while I think I’ve improved in some ways, I still have a very difficult time moving past initial rejection. Take my novel Queen of None (you can pretty much follow the story of the novel here). It was written in February of 2009. That is nearly six years ago. I wrote it very fast, and it had a great deal of promise. But after a single rejection I trunked it. Yes, trunk novels are a thing. I have trunk novels. I was expecting to see Queen of None in the same way I’d seen it before. A book with potential, but something missing that I couldn’t put my finger on. But now, suddenly, I can put my finger on it. And out of the ashes, my Arthurian tale has potential. I can see what wasn’t working, and I can see the possibilities for making it better. Write an Arthurian tale about Anna Pendragon (i.e. what I’d write my Masters thesis on if it could have been fiction). Anna was Arthur’s sister, and appears in some of the early texts about him, and is the mother of Sir Gawain. Then she’s quickly supplanted by Morgaine, Morgause, Elaine, etc. The cool thing? She’s Arthur’s full sister. The child of Uther Pendragon and Igraine. I saw her as a person detached, a woman as close to the most powerful man in the realm as anyone but without any of his inheritance. Anna is the narrator of the novel. And I wanted her to be unreliable. But while it’s done well in some parts, there are areas that need help. Most importantly is her relationship with Sir Bedevere — who is the love of her life even if she won’t admit it. I have a habit of dropping him from the scene altogether, but he needs to show up even when she’s trying to avoid him. Which is why tension is so important. I need to think of every chapter as pulling the threads tighter. Also? A total aside, but I realized that it reads far better with fewer contractions. Lots of apostrophe destruction has ensued. Write Camelot the way the Pre-Raphaelites saw it. From an aesthetic perspective, this was my guiding star. But it also bled into my decision to write an Arthurian tale without Christianity. The first go round I felt this was absolutely the right choice to make, that it set this apart from other retellings. But reading through it now it seems more of a missed opportunity, another chance for tension. It gives me the chance to play with the idea of magic and belief, and not just wave it off. It also helps the next point considerably. Write the story of Arthur from inside Camelot. Or, Carelon as it’s called in the book. But Anna isn’t a knight. She isn’t a warrior princess. She starts the book as a widowed mother of three, relinquishing the crown of Orkney to her brother, and consigning herself to a life lived within the walls of the kingdom. In the novel she travels a single time, to visit Viviane (the Lady of the Lake) and that is only a few hours’ journey. So much of the Arthurian saga is about adventures, leaving. 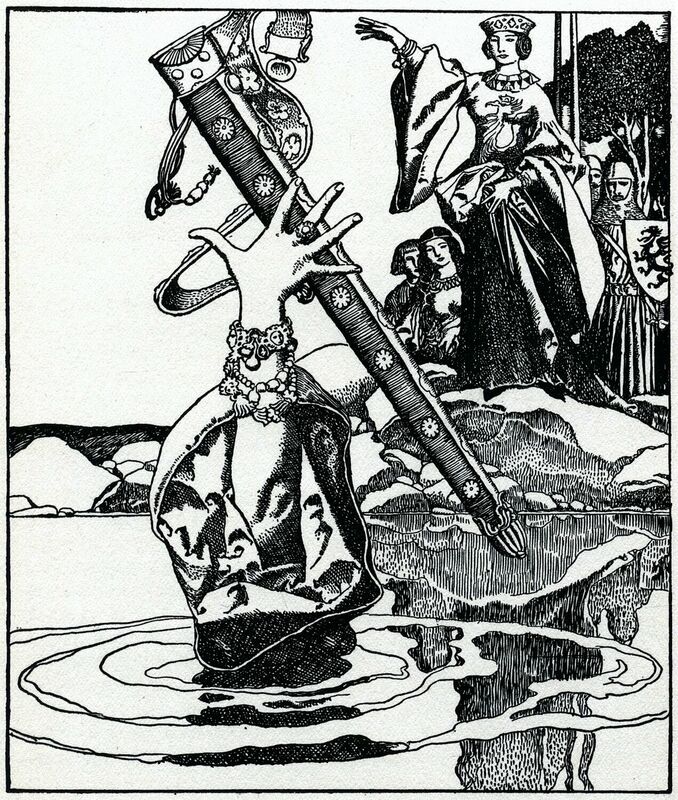 But the women are always like weird accessories — hanging out in lakes, woods, carrying swords, that sort of thing. I wanted to tell a closer tale, something that shows how much machination can happen within the confines of a castle. Anna is trapped, but she’s not powerful. I noticed this time how little Carelon seems a character. And it really needs to be. It starts out that way, as that’s where Anna grows up and she has a habit for running away and hiding in cupboards. Her success in the story has to do with her ability to navigate Carelon like no one else can — not even her brother. In a way, it’s her greatest weapon. She may not have Excalibur, but she has the greatest castle in all of Braetan. Write a story about the women of Arthuriana. With only one exception (Morgause) the women of Queen of None are complex and faulted and interesting. Anna has her prejudices, but as the story unfolds, her understanding of the women around her — many of whom she views as enemies or competition — changes significantly. She gets older, her sisters and friends get older, Carelon starts to fall apart. Their relationships are absolutely central to the story — especially the connection Anna has to her half sisters. Anna may not be afforded adventures in foreign lands or be capable of slaying dragons, but she is capable of changing history with the help of the women around her. There’s a lot to do. But for the first time, reading this manuscript doesn’t feel like a burden. It feels like a great chance to tell this tale. If there’s anything I’ve learned in this crazy attempt at a writing career, it’s that every journey is different. Not just for every writer (hence why I don’t give writing advice any longer) but for every story you tell. Some writers create stories very strategically. Books are process, planned, unsurprising. But every book I write means something different to me, and while some of them certainly fall in the the planned and plotted category, not all of them are. Queen of None is a great example of having the right ideas at the wrong time — not being quite capable of the execution, but knowing the big picture. It’s just part of a longer journey than I first imagined. And so it goes. My editing method this time around is very different. First, I am just reading and commenting. Then I’m going to take the whole damned thing apart and examine it. Novel dissection. Only then will I be able to pull taught all those strings and make the whole thing sing.